West Vancouver is one of three municipalities that make up the North Shore, and is a member municipality of Metro Vancouver, the governing body of the Greater Vancouver Regional District. The municipality is responsible for managing and protecting the foreshore, but a number of other agencies are responsible for activities in the water, including the Port of Vancouver, the Coast Guard and the Department of Fisheries and Oceans. In Horseshoe Bay, on the western region of the municipality, is a BC Ferries terminal, a crown corporation of the Province of British Columbia. At the eastern border of the municipality is the Capilano Reserve, part of the Squamish Nation. West Vancouver works closely with these agencies. Metro Vancouver is a partnership of 21 municipalities, one Electoral Area and one Treaty First Nation. Its core services are drinking water, wastewater treatment and solid waste management. Metro Vancouver also regulates air quality, plans for urban growth, and manages a regional parks system. The regional district is governed by a Board of Directors of elected officials from each local authority. The District of North Vancouver is the municipality that borders West Vancouver on the east. The municipalities work together to provide some shared services, such as Emergency Management and Fire Department emergency response. Transportation corridors, such as Highway #1 and the Spirit Trail, cross these municipal boundaries. The City of North Vancouver is surrounded entirely by the District of North Vancouver. The municipalities work together to provide some shared services, such as Emergency Management and Fire Department emergency response. Transportation corridors, such as Highway #1 and the Spirit Trail, cross these municipal boundaries. The waters of Burrard Inlet—from the Lions Gate Bridge to Point Atkinson in West Vancouver—are managed by the Port of Vancouver. Bringing together port industry, municipalities, First Nations, and North Shore residents, the North Shore Waterfront Liaison Committee was established to proactively communicate about and address local port-related issues. A portion of Squamish Nation lands lie within West Vancouver’s municipal boundaries. The two governments share services such as policing and bylaw enforcement, park lands, and engineering infrastructure. 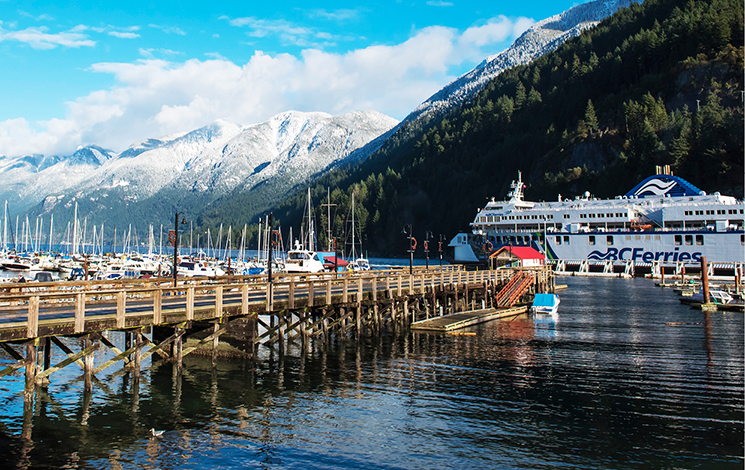 The BC Ferries terminal in Horseshoe Bay provides ferry service from the lower mainland to Nanaimo, the Sunshine Coast and Bowen Island. In West Vancouver, the Ministry of Transportation and Infrastructure is responsible for Highway #1 (Upper Levels) and Taylor Way. The bridges to Vancouver (Lions Gate and Iron Workers Memorial Bridges) are also under the jurisdiction of MoTI. Fisheries and Oceans Canada (DFO) is the federal lead in managing fisheries and safeguarding Canadian waters. The Canadian Coast Guard (CCG) is a special operating agency within the DFO, and is responsible for the safety, security and accessibility of Canada’s waterways. The provincial Ministry of Environment is responsible for safety issues such as land-based spill response, and provincial parks such as Cypress, located in West Vancouver’s Upper Lands.